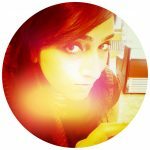 First blog post of 2019, and of course I was wondering on what to write about. It is also quite some time that I wrote something last so need to get into the habit of writing once again. But, for the first post of 2019, I chose to share my most favorite out of all the trips I made in 2018. And you will find out in the post on why it was the most surprising one as well. 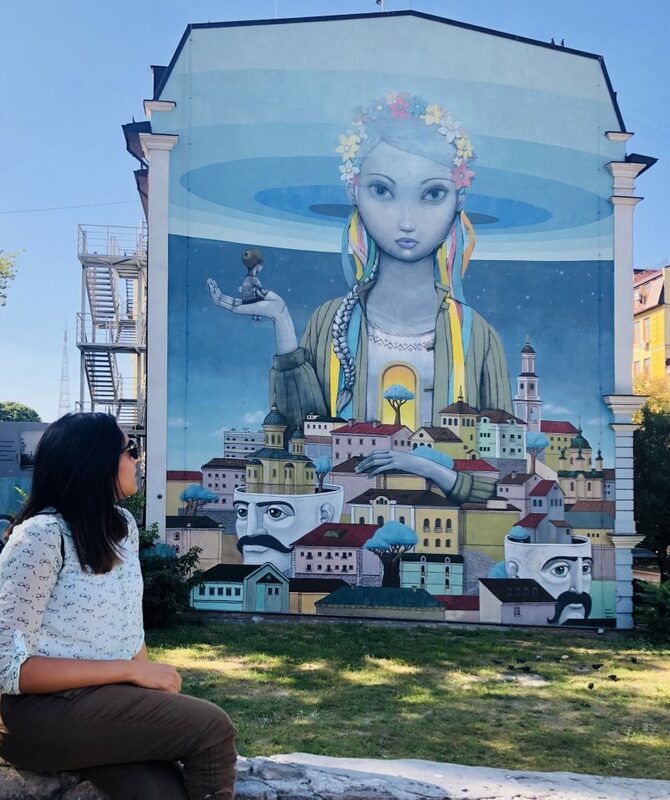 To celebrate the birthday of one of my close friends in Munich, we made a trip to her land and visited the beautiful city of Kiev in August. 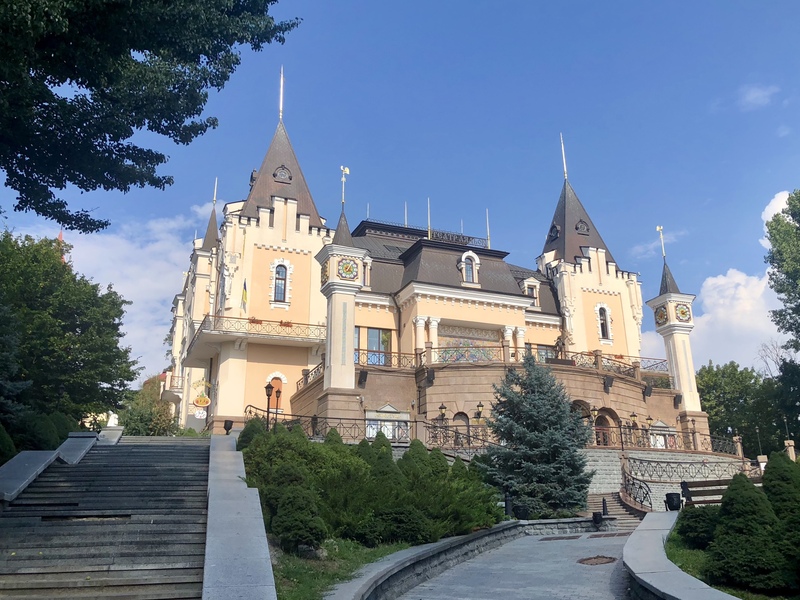 It was a new destination for most of us and none of us was sure on how the experience would be and what Kiev has to offer to such a multinational group. At the end, we were all very thankful that our friend Nataliia asked us to join her to this lovely city. And let me tell you why! Kiev is culturally very rich and has a lot to offer. From old streets, to orthodox churches, to river side beach clubs and walkways, to amazing restaurants and cafes, to amazing city squares. And it a perfect budget city trip to make for 4 to 5 days. It is also very different from the typical European cities you know. For me, it was a mix of east and west. So, let’s explore one of the cheapest holiday destinations in Europe. 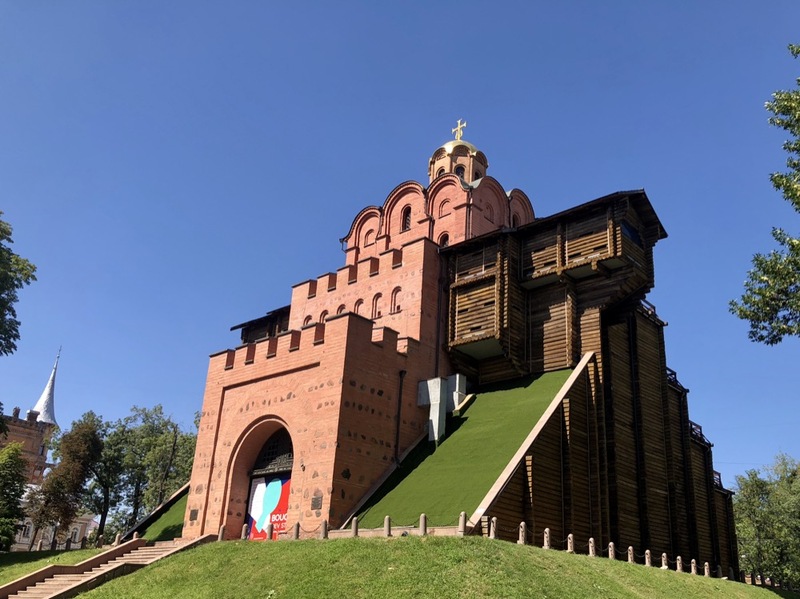 We were very lucky that our friend planned the trip for us and made sure we make the most of our 4 days in Kiev and cover all the important “things to do while in Kiev”. And to help you plan your trip like a local, let me share with you how our 4 days looked like. After enjoying our breakfast in Fandom Coffee Bar, we started our Day 1 by going to the Golden Gate Kiev. It was the main gate in the 11thcentury fortification. I highly recommend visiting inside. Then we walked to the Saint Sophia Cathedral. It is one of the best landmarks of the town and amazingly beautiful. The bell tower is not be missed. Spot for amazing pictures – click click!!! After this, we walked our way to another architectural masterpiece, Saint Andrew Church. From here, you follow one of the most amazing old streets of Kiev “Andriyivskyy Descent”. This street has a lot of local shops and stalls and is also the best place to buy any souvenirs from Kiev. 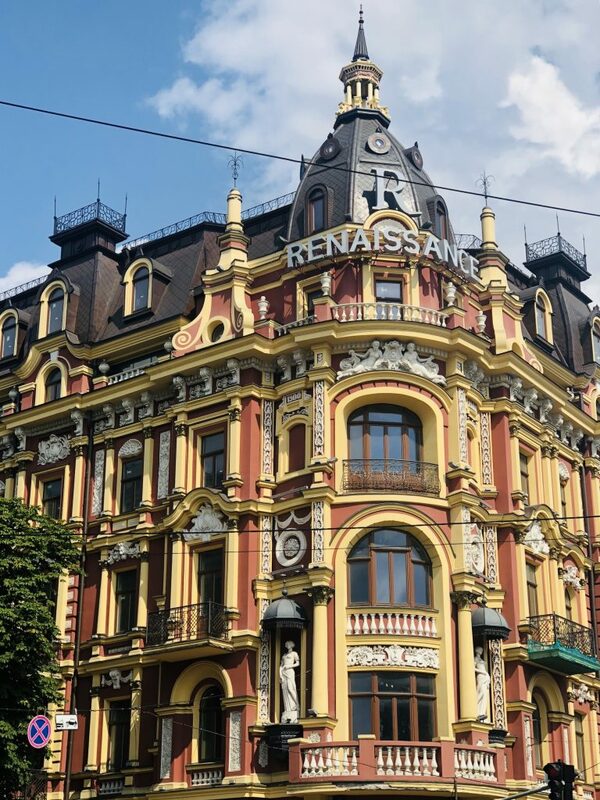 Throughout the day, you will observe so many amazing buildings as Kiev has kept the old buildings very well and just walking to all these places, there is so much more just to observe on all sides. Passing the Andriyivskyy Descent, we arrived at the Port of Kiev. 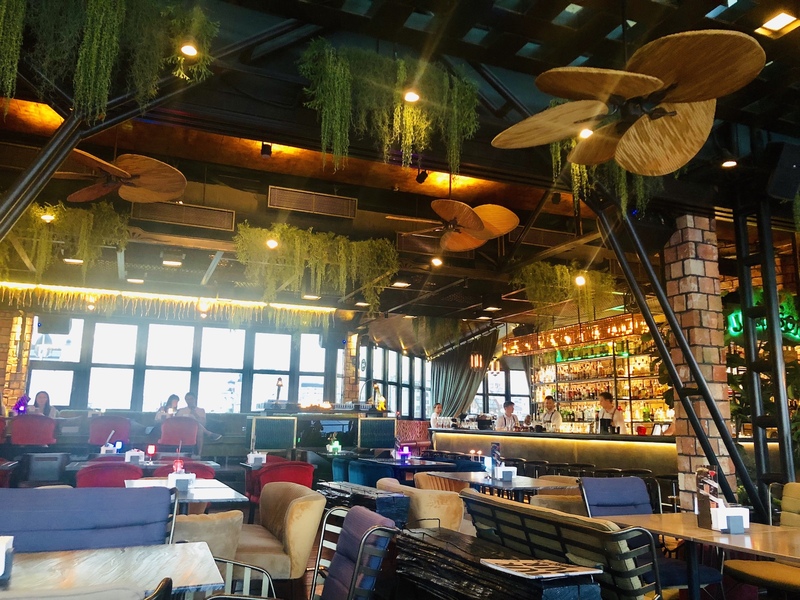 This is amazing place to spend summer eves as you have riverside walkways, chance to do a boat ride, or simply enjoy one of the amazing cafes with views. You can also just smoke shisha and sit on those comfy bean bags along the shore. We picked the place called “Kompot“, and as the name says, it serves amazing Kompot drinks (very traditional fruit drinks from Ukraine. The place also has amazing Ukrainian dumplings (Varenyky) which you should definitely not miss. After Mur Mur, we ended the night in Barman Dictat. Started off by visiting the Independence Square of Kiev (Maidan Nezalezhnosti). It is the central square of the city and is also the place where the historical protests took place at the end of 2013 resulting in 2014 Ukrainian Revolution. The main street there is best to visit on Sundays and public holidays at it is closed for traffic on those days and you can just walk in the middle of that wide-open road on both sides. After that we visited Khreschatyk Park and went to the must-try Georgian restaurant inside the park called, Saperavi. If you have read the guest post on my blog on Saint Petersburg, you would know why Georgian cuisine is so special. After this, we walked to the Druzhby Narodiv (Friendship of Nations Arch) and had amazing views of the whole city. From here, you can either take taxi/Uber or walk to the port and enjoy a sunset boat trip. Our day ended with amazing dinner at the Ukrainian traditional restaurant called Petrus (Tip: Try Ukrainian dumplings “Varenyky“, “Pierogi” and Ukrainian mixed pickles). 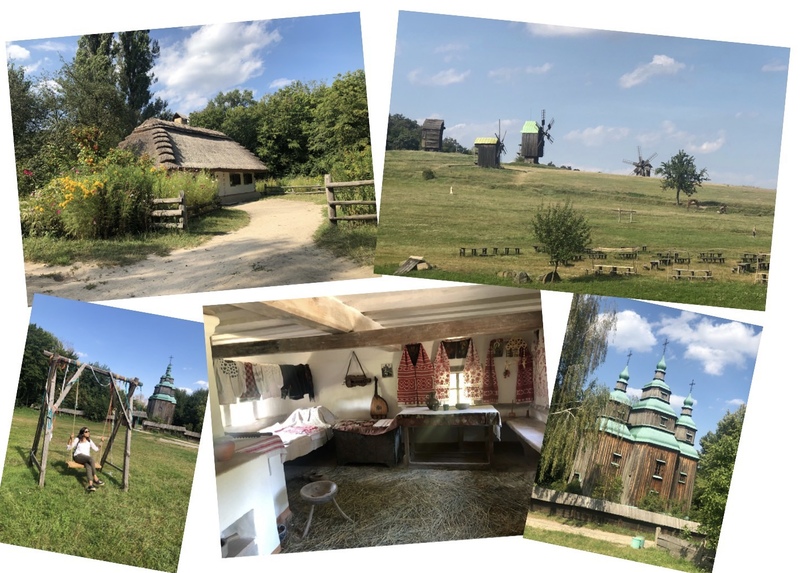 After breakfast in Wolkonsky café, we went a bit outside the city to visit the Pirogova Village and Open-Air Museum to get a flavor of Ukrainian country side living and history. We took Uber to reach there. You will be walking here a lot so do carry some water and some snacks. On way back to Kiev, we made a stop at the Mayachok Beach Club where things get posh. The deck they have on the river is great to enjoy a drink, coffee and some snacks. It’s very quiet, calm and peaceful. After that, it’s time to rest a bit. 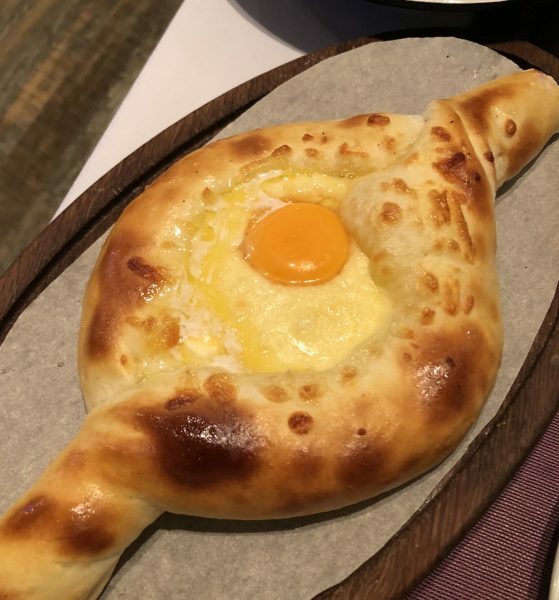 And if you plan to head out for dinner, Georgian restaurant Chachapuri would be my choice (Tip: order Georgian cheese and egg bread for starter – called Khachapuri). Or you can go for a drink at the rooftop of Atmosfera Restaurant (Caution: Dress up for this place and expect high prices for Ukraine). We only went there for some snacks and drinks. Kiev is full of amazing small breakfast cafes and coffee places. For day4, we picked one of the oldest and most traditional breakfast places in the city called, Yaroslava bakery (Bulochnaya Y Restoran Yaroslava– Yaroslaviv Val St, 13, Kyiv, Ukraine, 01001). It is famous for having a lot of different flavor fillings for the traditional breakfast pastry called Piroshkis (typical from Ukraine). And the cottage cheese pancaked (Syrnyky) are to die for. You will see plenty of locals having their first meal of the day here. It is an extremely budget friendly place (also good for lunch). 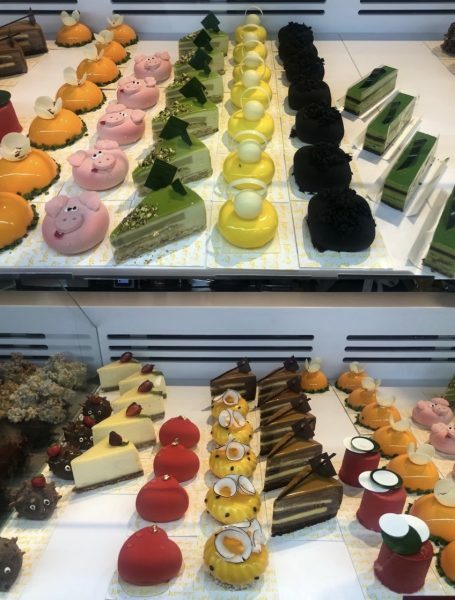 Right in front of it is another amazing modern breakfast places called Honey Café-Confectionery (20, Kyiv, Ukraine, 01034).We could not have breakfast any more, but the amazingly designed cupcakes and pastries they have, are a treat for the eyes and tummy. I definitely had to try one! 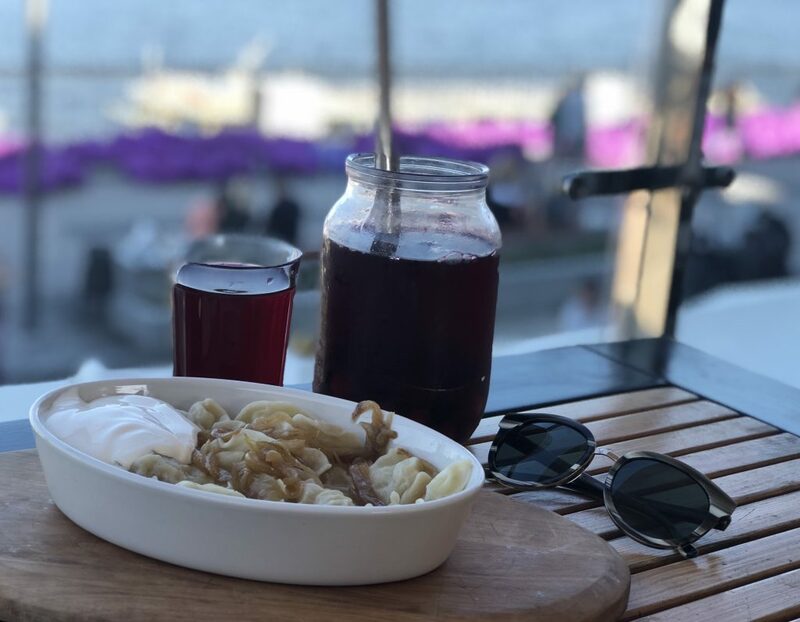 After the day at the beach club, we were craving for some good food and our friend picked the traditional Ukrainian restaurant Pan Garbuzyk. Amazing food and very budget friendly. You should definitely try Ukrainian pickles and dumplings. 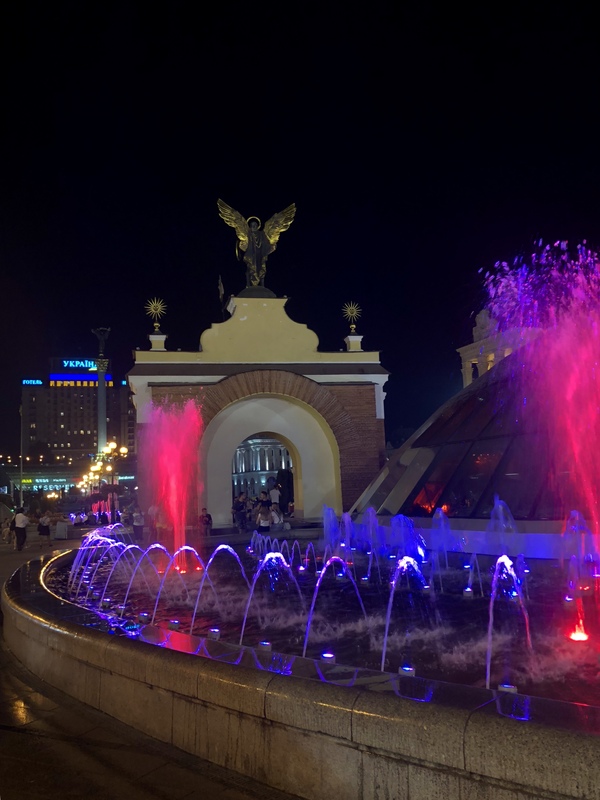 And sadly, it was also the last night for us in the city and we ended that by watching the dancing fountains at the Maidan (independence square). 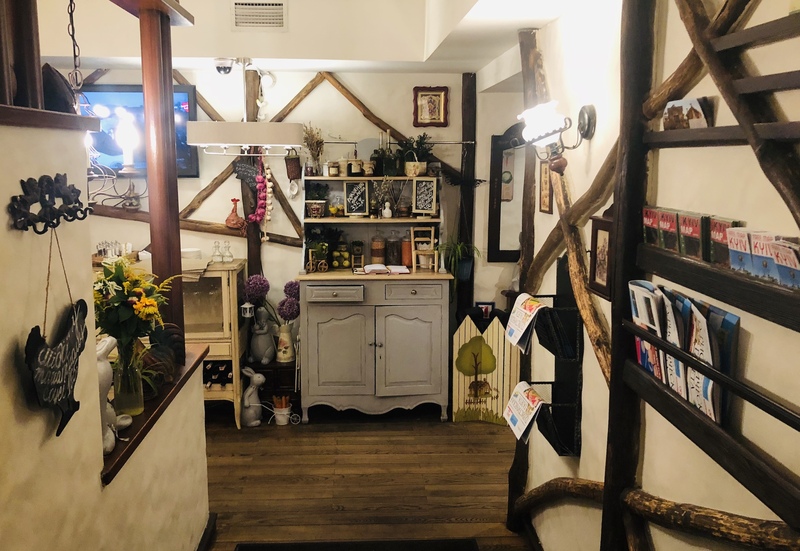 To stay, I would recommend, anywhere on the Bohdana Khmel’nyts’koho St (we stayed here), or close to the river (where Kiev Port and Poshtovyy Budynok is). You can get Ukrainian SIM card with free internet for as less as 3 Euros for the whole month. You can also get them in small kiosk shops along the streets that sell drinks. Language is an issue as not everyone speaks English, especially in the shops. Generally, it is a safe city, but you should not leave the main touristic areas at night. The restaurants mentioned in this post are picked by the locals, so you are safe with the choices. For traveling, use Uber if you know where you are going as you can just add address in the app. Places have different names in Ukrainian and English so can be confusing sometimes. You can have an amazing lavished meal in Kiev with drinks in 7 to 10 Euros per person. For breakfast or as a snack, must try sweet or salty pastries called Pyrogy and Cottage cheese pancakes called Syrnyky. If you have some time on one of those days, visit Kiev Pechersk Lavra (also called Kiev Monastery of the Caves). It is a UNESCO world heritage site. I hope this post convinces you to visit this amazing city. It is perfect city trip if you live in Europe for one of those long weekends. You can find good flight deals and the city itself is very budget friendly. I would recommend going in summer though. Thank you. And definitely would like to return! Reading this post I became very curious to know Kiev personaly. I was also very pleasantly surprised as I honestly did think that it has so much to offer. And the city vibe is really nice!